TO WebFest’s Matrix Trailer Has You! A post for the TO WebFest 2014 Blog by Regan Latimer (Producer/Director of Programming for TO WebFest), leading up to the May 2014 event. It was with great excitement that we launched our Official Trailer for TO WebFest 2014 this past Wednesday. We wanted to uniquely showcase not only the official selections, but also the festival itself, describing in an entertaining way exactly what we’re all about! And what could be more appropriate to that end than a Matrix Parody? Well, indeed. The whole process for the trailer’s creation took myself and Robbo Mills two weeks to complete. On the day we filmed Rob’s portions, we had the talents of wardrobe guru, Jane Edmondson, and make-up and hair artist, Rikki Zucker, bringing their skills and expertise to the table. 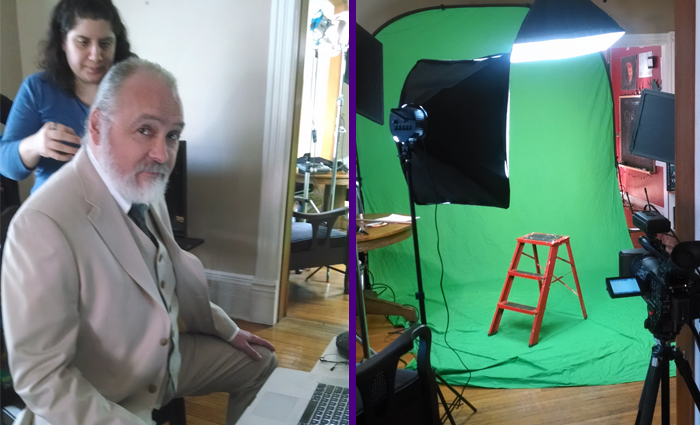 One green screen, one cream coloured suit, and one red footstool later we were all set to get the project underway. It was certainly an ambitious undertaking, but Rob and I were dedicated to bringing this trailer together. We knew, once finished, it would be the kind of piece that would generate the right feel and buzz for the inaugural Toronto Web Series Festival. Many long hours of editing, graphics, CG work and collaboration ensued, and I have to say, we’re pretty delighted with the result. The excitement is certainly growing for us here at the festival. Only three weeks to go until web series creators from around the world descend on Toronto to take part in this year’s event. Next stop, TO WebFest 2014! « Web Series Festivals – What’s the story? » London Web Fest Bound!